Gardens often are replete with mystery, but murder? Well, yes. 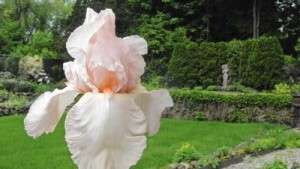 In a very entertaining story, The Financial Times reports on a garden at Torre Abbey in Torquay, England, where the various plant species that Agatha Christie used in her murder mysteries to dispatch hapless victims have been assembled. Torquay is a seaside town on the south coast of England where Christie was born and had a vacation home later in life. 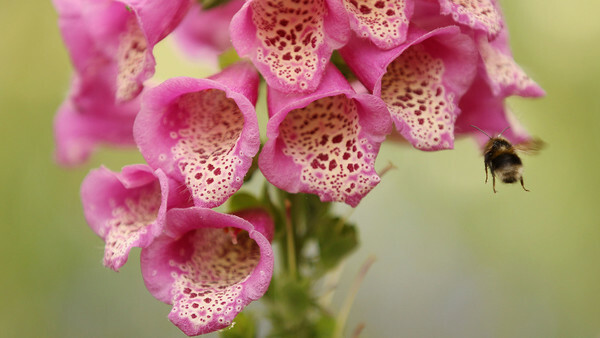 From ricin hidden in fig paste sandwiches to digotoxin, derived from the foxglove plant (which Agatha used to bump off Mrs. Boynton in “Appointment With Death”), the Potent Plants Garden, managed by head gardener Ali Marshall, seems like quite a deadly delight. 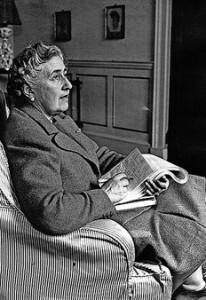 Photos via the Financial Times, from top: Ali Marshall, Agatha Christie, foxglove. Harry Link, a master gardener who lives in East Haddam, had the great pleasure of being Lee May‘s friend. They were next-door neighbors for 12 years until Lee, a well-known garden writer, moved back to Atlanta from Connecticut in 2013. Having just been in touch by email with Lee in November, I was stunned and terribly sad when Harry told me that Lee died in December after a short and difficult fight with cancer. 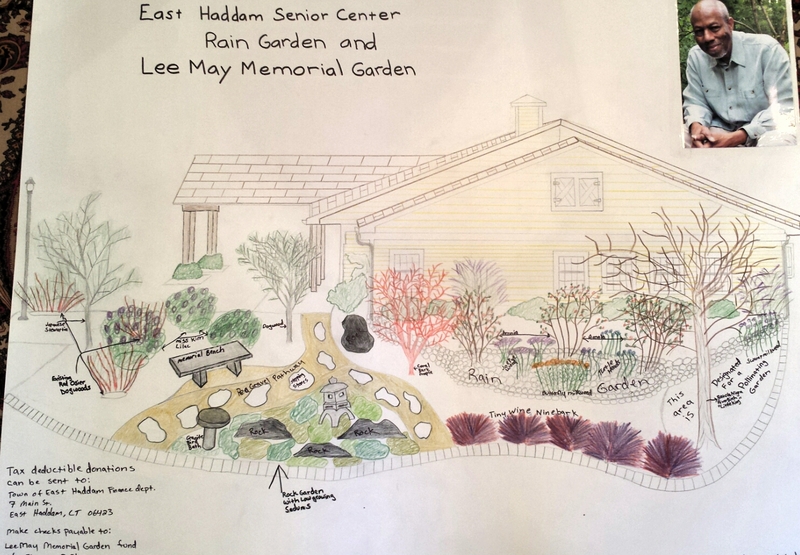 Now Harry is planning to install a memorial garden at the East Haddam Senior Center in Heritage Park to honor Lee. The garden will be dedicated on May 30 — and it will be a surprise for Lee’s wife, Lyn, who will be visiting for a memorial service. Harry told me that Nancy Ballek Mackinnon, a partner at Ballek’s Garden Center in East Haddam, is contributing “tons of perennials,” and other garden centers also are donating plant material. One section of the garden will be planted to attract lots of pollinators. 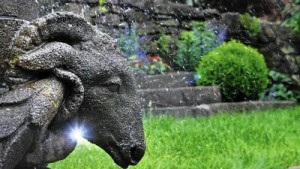 And, as an homage to the distinctive style of Lee’s own garden — with its rock assemblages and dry bed stream of stone — Harry plans to incorporate those sorts of elements as well in the memorial garden, on town property just off Great Hillwood Road and Route 149. The gently curved garden — about 90 by 45 feet — also will incorporate a rain garden and several pathways, and Harry says he’d like to buy an arbor for an entry. Harry has set up an account with the town for cash contributions (which are needed). They are tax-deductible, and can be made to the Lee May Memorial Garden Fund, East Haddam Finance Department, 7 Main St., East Haddam, CT 06423. “Lee meant so much to me, so I just want to honor him the best I can,” Harry said. I can’t think of a more fitting tribute. 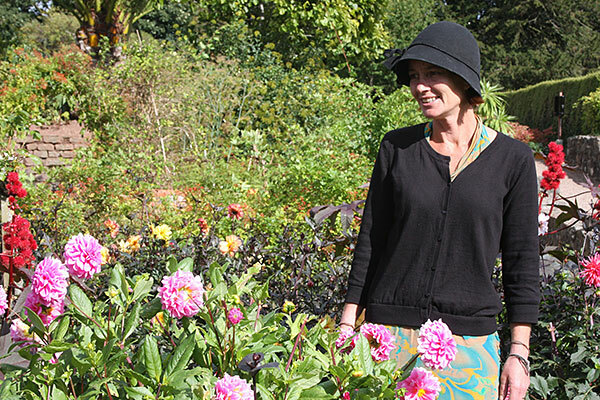 I met Lee and Lyn when I visited to write about and photograph the garden back in 2010. 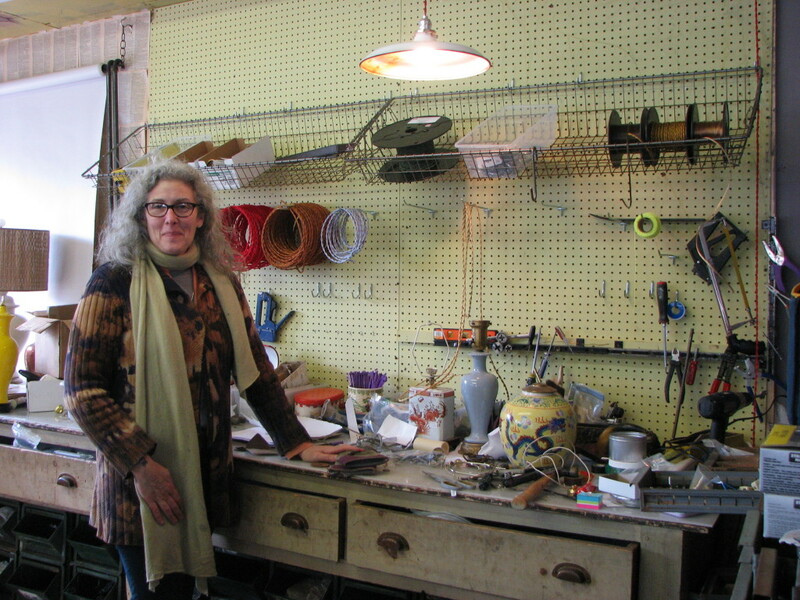 Lee had shifted gears in the early 1990s from being an award-winning hard news and investigative writer for the Los Angeles Times and the Atlanta-Constitution to focus on garden writing. 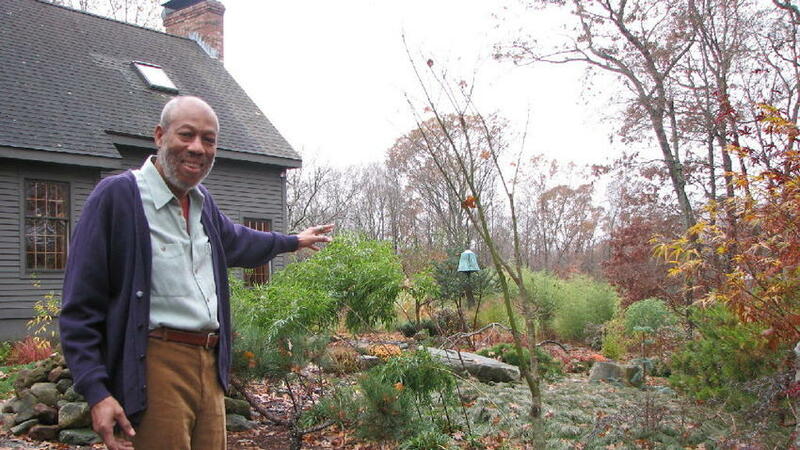 Lee’s distinctive garden in East Haddam was one of Asian grace and playful touches. His quiet humor rippled through the landscape. For example, he tucked rubber snakes here and there in an effort to scare off squirrels. “They were amused,” he dryly observed. Lee’s passion for pruning trees in search of their essence was fascinating, too. Most of all, I was touched by Lee’s gentle demeanor, his sheer pleasure in both story-telling and in creating enticing and enjoyable spaces in nature. He worked with nature and shaped it, but he clearly revered it, too. Take a ramble through his wonderful blog: Lee May’s Gardening Life. And here’s my story: Click here. Lee May at his garden in East Haddam. 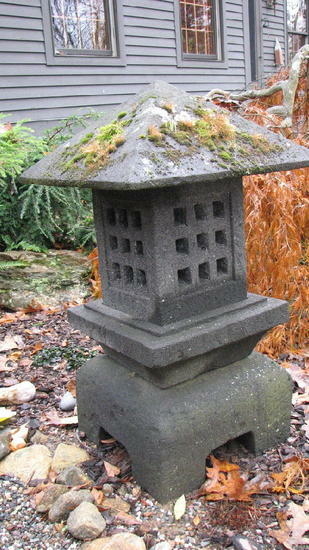 A Japanese lantern harmonizes with the stone and rock in the garden. 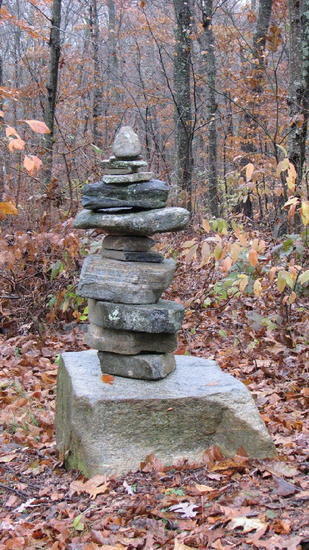 One of a number of handmade cairns. 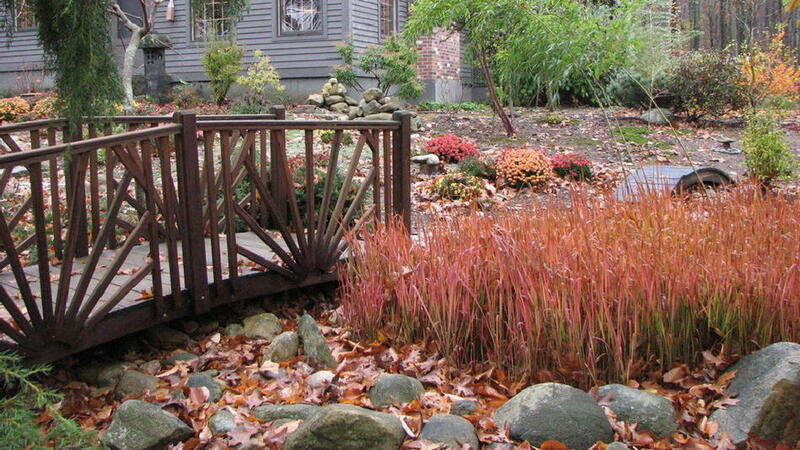 Japanese blood grass, one of many varieties of grasses in the garden, adds a brilliant jolt of color alongside a bridge over a dry bed stream of stone. 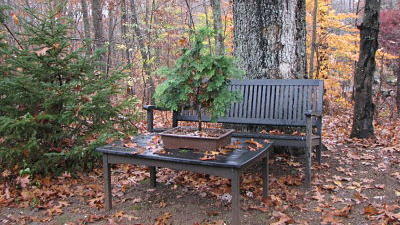 Bonsai played an important role in Lee May’s East Haddam garden. 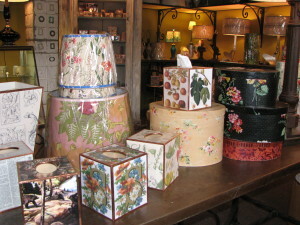 Susan Schneider of Shandell’s — acclaimed for her wildly creative handmade lamps and lamp shades — recently moved her business from Ivoryton to Chester. In case you missed it, here’s the story I wrote about her last summer: Click here. This month’s issue of Hartford magazine is all about secrets — and included are two secret gardens that I’ve loved visiting. 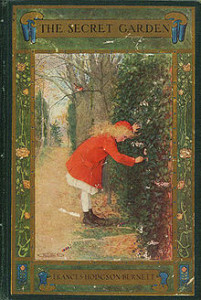 Secret gardens have captivated me since girlhood — even before I first read Frances Burnett Hodgson’s classic novel, “The Secret Garden,” rooted in the wisdom of a garden as a healing, health-restoring tonic. In particular, I was entranced by the sheltering bowers of rhododendrons at my grandparents’ home, where I often played hide-and-seek with my siblings and cousins (all of them younger than I). Those hiding places offered quite a refreshing respite; I could get away from the fracas and daydream, yet still be part of the action. Back in 2010, work had just begun on what is now the glorious Heritage Rose Garden, in an intimate and often-overlooked corner of Elizabeth Park. 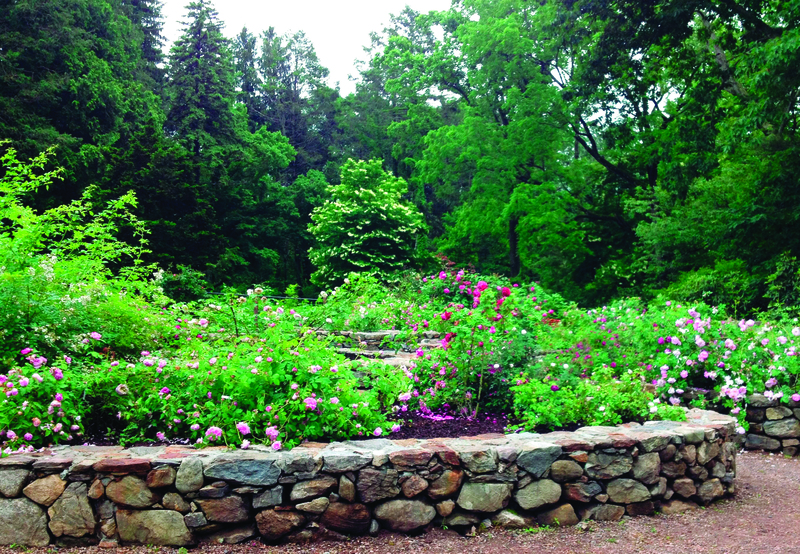 Restoring the garden and replanting Elizabeth Park’s collection of old roses — and I mean old, all of them developed prior to 1867 — was the centennial project of the Connecticut Valley Garden Club (though the actual centennial isn’t until 2017). One of the ancient roses included is the Apothecary Rose, at right, developed before 1240 and thought to have been brought to France by a returning Crusader. 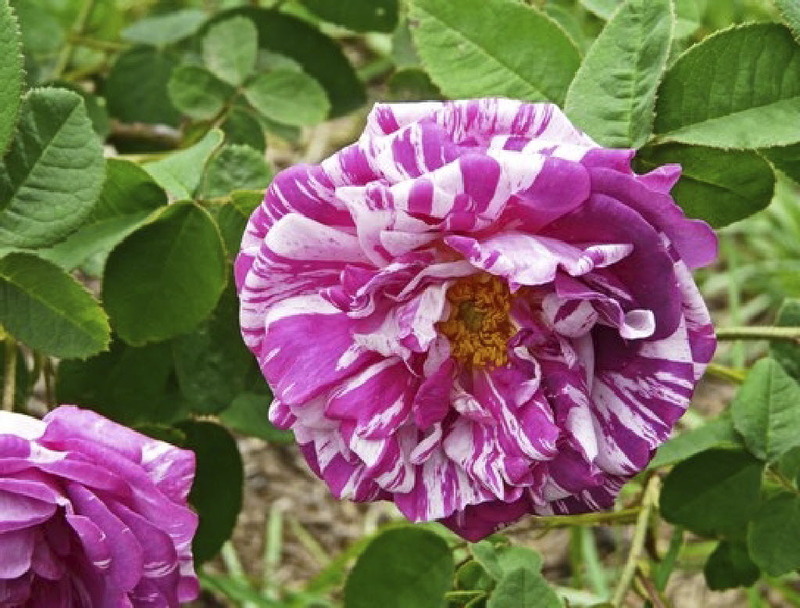 Alice Prescott Whyte, an aficionado of antique roses and author of “The Roses of Elizabeth Park,” designed the 10 raised beds in a lovely rosette pattern. 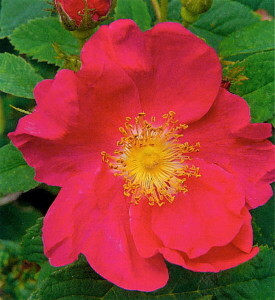 Her photographs of roses are featured here. 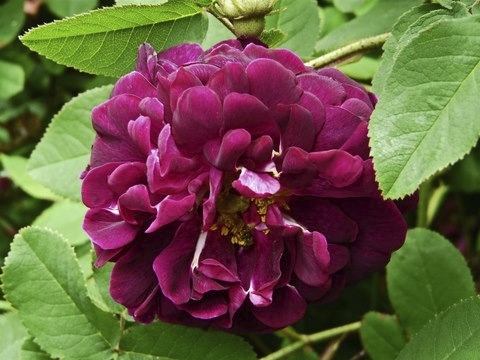 Back in 2010, when volunteers were replanting the roses and the garden still looked pretty bare, Alice told me that the popularity of contemporary Knockout roses has knocked a lot of older roses out of favor. “We’re saving history, one rose at a time,” she said. The Heritage Rose Garden is tucked a little bit out of sight so be sure to make a point of discovering it later this spring, when the park’s famed Rose Garden arches and beds are in full flowering glory. 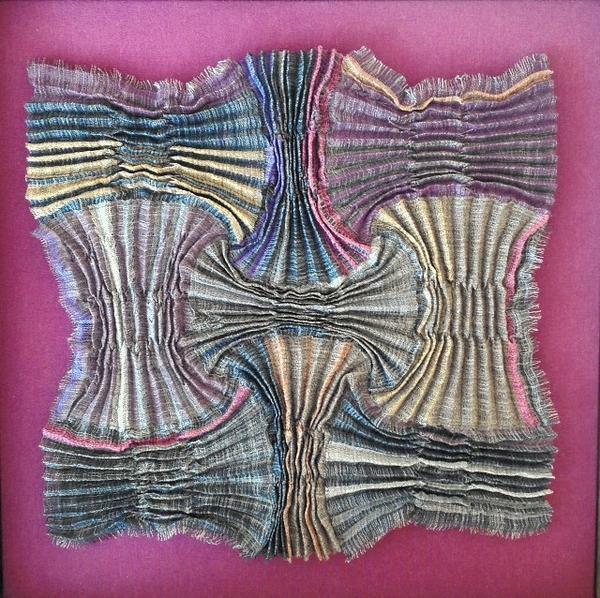 For now, feast your eyes on Krystian von Speidel’s appreciation: click here. 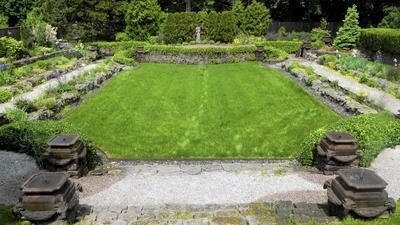 Meanwhile, Iris Van Rynbach writes about another hidden garden — this one in Farmington, created by landscape architect Fletcher Steele in 1954. A pioneer in landscape design, Harvard-educated Steele designed nearly 700 gardens in his career. Many were at grand estates, like the renowned gardens he designed in the 1920s at Naumkeag in Stockbridge, Mass., now a museum, with its renowned Blue Steps flanked by white birches. It was quite a coup for Stuart and Mary Smith to have the highly exacting designer transform their 1-acre yard on Main Street — which he initially derided as looking like Tobacco Road — into such a serene showplace. Here’s a link to Iris’ story: click here. I love the tale of how the garden was created in the 1950s by the renowned Steele, who had a fondness for martinis and a rather authoritarian streak. And here are a lot more photos of the garden, by Mark Mirko and yours truly: click here. Photos, from top: Heritage Rose Garden at Elizabeth Park (courtesy of Elizabeth Park). Cardinal Richelieu, Apothecary and Camieux roses (by Alice Prescott Whyte). Farmington garden, including view of ram’s head fountain drenched with water (all three by Mark Mirko). 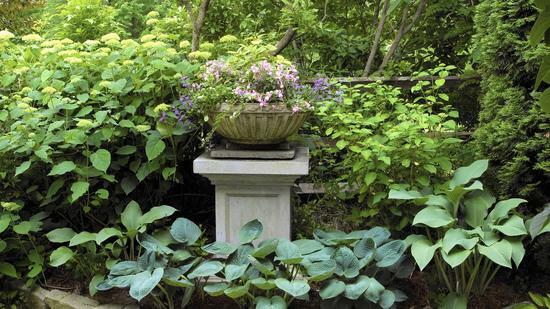 Before you rush willy-nilly into the garden this month… the experts I talked with for my latest gardening story in the April issues of Hartford magazine and New Haven Living offer this advice: Wait. You don’t want to compress the soil and the crowns of plants you can’t yet see by walking around on too early in the garden, or jump the gun by removing leaf debris and wind up exposing tender shoots to a late frost. But there is a lot you can do this month to ensure a gorgeous garden ahead. Click here for the story.